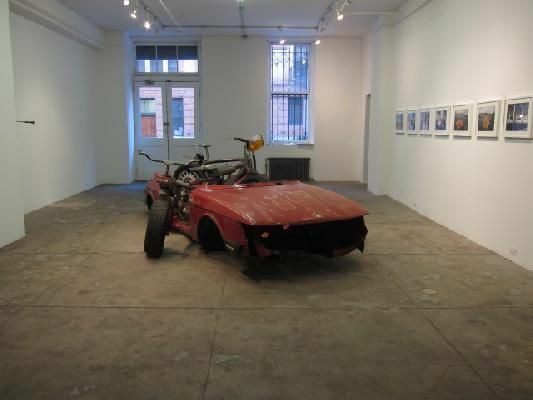 The Jack Hanley Gallery is pleased to present Folke Köbberling and Martin Kaltwasser's installation, Postautomobilzeitalter. The exhibition includes structures and ideas that resulted from one of the recent public projects of urban intervention staged by the Berlin artists. 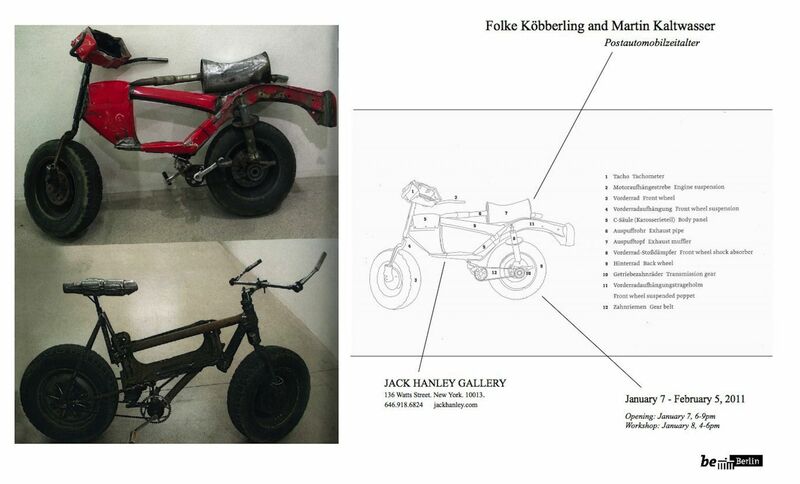 In the spring of 2010, Köbberling and Kaltwasser together with students of the Art Center College of Art and Design transformed cars into bicycles. The artists and students occupied several parking spaces at Bergamont station in Santa Monica, California and temporarily turned the parking lot into a car dismantling/bicycle building workshop. In a matter of 500 hours, they converted a Saab 900 turbo into two fully operational bikes. The two bicycles constructed during the project will now stand as catalytic objects in the space of the gallery. 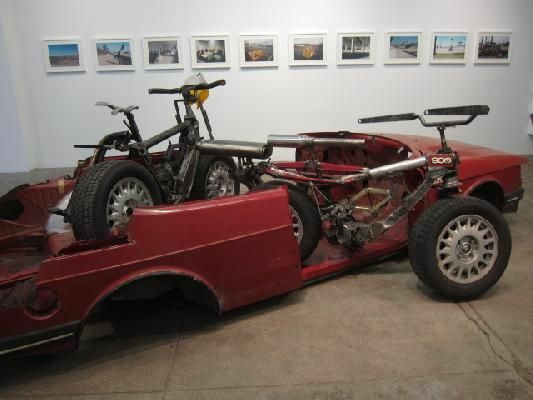 The carnage of the transformed Saab will also be on view as testimony to the endless potential of our waste. As part of their exhibition, Köbberling and Kaltwasser will host a workshop on January 8th from 4 to 6pm to discuss a post car production future. What alternatives do we have, could we imagine a continent without individual motorized transportation? The artists will speak from their year long experience as a family living in Los Angeles without a car. Participants will be encouraged to join the discussion by drawing their ideas on the gallery walls. The result will be a collaborative work that proposes what a future without individual motorized transportation might look like and how it might affect our urban landscape. Folke Köbberling and Martin Kaltwasser have been elaborating their idea of an artistic and architectural aesthetics of resistance since 1998. In guerrilla architectural interventions, the artists make use of streets, squares, bridges, parks and interiors as operational spaces and always use unwanted urban resources as their material to do so. Folke Köbberling studied Fine Arts at Kunsthochschule Kassel/Germany and at the Emily Carr Institute of Art and Design in Vancouver and received her MA from the Academy of Fine Arts in Kassel/Germany. Martin Kaltwasser studied Fine Arts at the Academy of Fine Arts in Nuremberg, Germany and the Technical University Berlin, where he received his Diploma in Architecture. They have exhibited extensively in Germany and internationally and were most recently included in the 2009 Architecture Biennial in Sao Paulo and Martha Museum, Herford (Germany). Recent solo exhibitions include Power Plant, Marfa/USA (2010), Galerie Anselm Dreher, Berlin (2009), Ujadowski Castle CSW, Warsaw/PL (2009), Architekturgalerie am Weißenhof, Stuttgart (2009), Artforum Berlin (2007) Lothringer 13/Laden, Munich (2008), Simultanhalle, Cologne (2008), Shedhalle , Zurich (2007).